Dermal Fillers, like Juvederm, Voluma and Restylane are made of a clear, non-animal, biodegradable gel based on a natural substance called hyaluronic acid. The gel is injected into the skin in tiny amounts. The result is instantaneous and produces a long-lasting, natural enhancement that is gentle and safe for your skin. Radiesse, on the other hand, is made of Calcium Hydroxylapatite, a biocompatible/bioabsorbable substance that is similar to what bones are made of. Dermal fillers come usually in 1 cc syringes. Most pricing is done as 1 cc syringes. Per rule of thumb is 1cc per decade of age plus one. For ex, if you are in your 40s you need about 4 cc plus one. The picture here gives an estimate of how much filler is generally used. However, every face is different and volume loss in face and skin laxity varies from person to person and with each passing year. 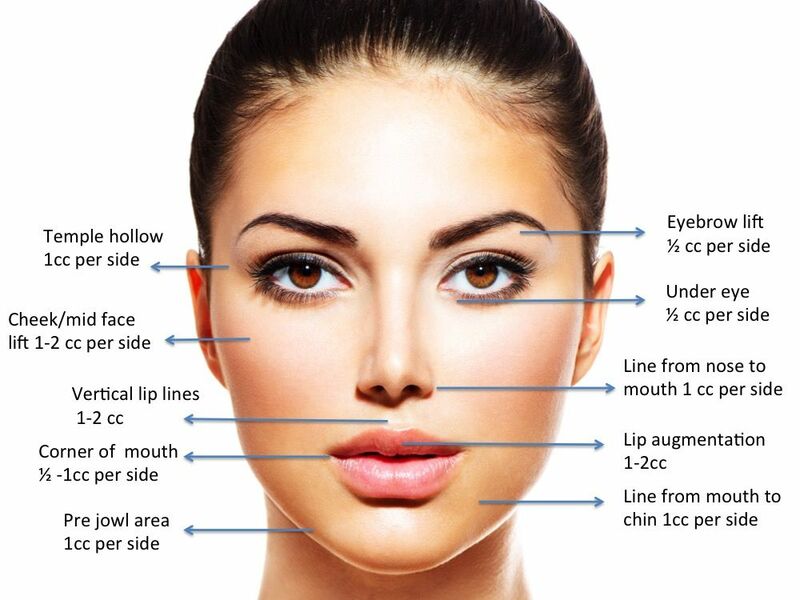 Facial symmetry and facial proportions play a major role in deciding how much filler you will need per area. You can plan your treatment and the time time frame the treatment is done based on your schedule and budget. Dermal fillers can last from 6 months to 5 or more years. Most fillers induce a collagen stimulating effect in the area injected. This gives the skin a longer supporting effect . During treatment, the filler is injected into the skin in tiny amounts with a very fine needle. The dermal filler produces volume under the wrinkle, which is lifted up and smoothed out. When enhancing lips or facial contours, dermal fillers add volume and shape to the treated area. 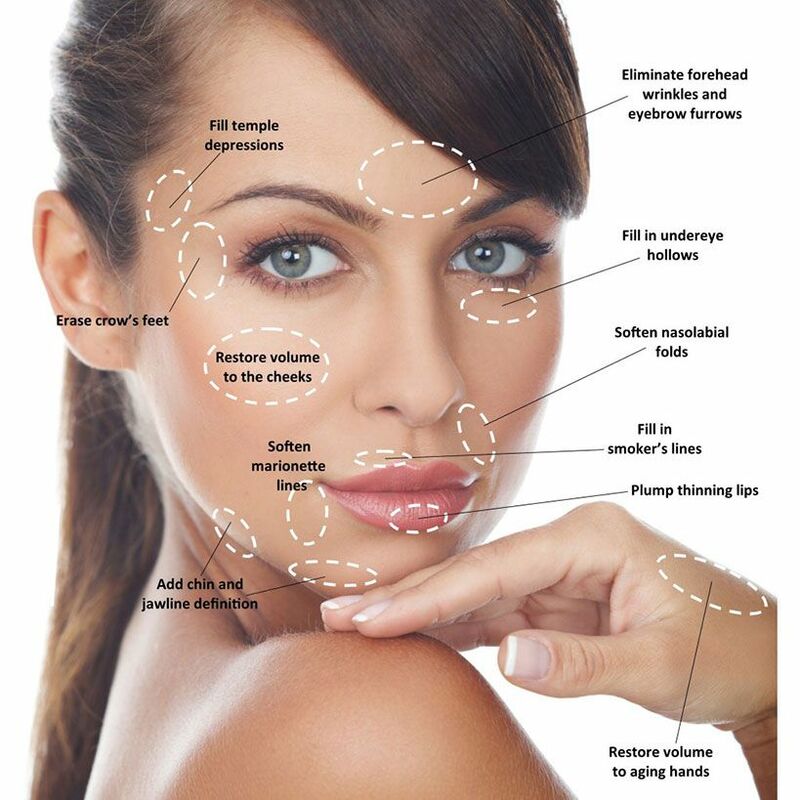 Treatment with Dermal Fillers is a quick and easy process. A treatment generally takes 30 minutes. The time differs somewhat, depending on the correction you wish to have performed. No. Treatment with all the dermal fillers offered at Natural Beauty Laser does not require the use of a skin test prior to treatment. Dermal Fillers can be used for smoothing out folds and wrinkles, lip enhancements and shaping facial contours while lifting the cheeks and filling in the temples. The most common areas are the cheeks, temples, undereyes, the nasolabial folds (from the root of the nose to the angle of the mouth), lips, and chin, although other sites can also be treated. Very superficial or very deep wrinkles may be difficult to correct. Your injector will consult with you before any dermal filler treatment to insure you are a good candidate. 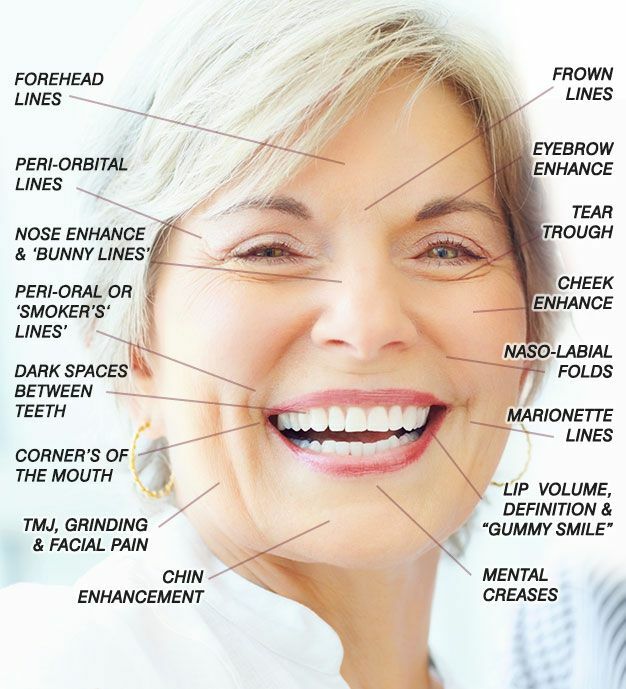 Dermal Filler wrinkle treatments are long-lasting but not permanent. In general, Juvederm, Restylane and Radiesse last up to 1 year. Voluma can last up to 2 years in the cheek zones. Juvederm lasts up to 6 months in the lips. The length of time a treatment maintains its effect is very individual and depends on many factors, such as the filler used, the location injected, your age, skin type, as well as the injection technique. Most people find the injections tolerable but not fun. We usually apply a topical numbing gel that contains Lidocaine and Tetracaine for 15 to 30 minutes prior to treating. The numbing gel fades after a couple of hours. The newer generation of dermal fillers all contain lidocaine to further minimize discomfort. It is rare for us to have to use a nerve block anymore. Dermal fillers are generally very safe. However, rarely there can be allergic reaction to fillers, accidental infection into blood vessels, or uneven results. Safety depends on the experience of the injector, area being injected, and the technique being used to inject the filler, as well as the type of filler used. Immediately after the treatment, you can expect slight redness, swelling, and tenderness in the treated area. This is a normal result of the injection. The discomfort is temporary and generally disappears in a few days. Bruising is very common and can last 3 to 14 days. Taking ibuprofen (Motrin), Advil, Aleve, Aspirin (baby or adult size), high dose Vitamin E, Flax seed oil in the week prior to treatment can dramatically increase your chances of bruising. Please avoid all of these for at least 4 days prior to your treatment, and aspirin for at least 7 days prior to your treatment. Alcohol intake can also increase your bruising risk. Arnica montana tablets or topically can help to expedite the clearance of bruises when they occur. Lumps and firmness where the filler was injected can last several days and are commonly seen in the lips. This is normal and can be massaged gently the day after your treatment. Most soreness should begin to fade after 2 to 3 days. You should notify our office immediately if there is any worsening discomfort after 3 days. What should I Bear in Mind After my Dermal Filler Treatment? Do not rub or massage the treatment area the first 12 hours after your treatment. Avoid strenuous exercise the day of your treatment. You can return to your regular exercise schedule the day after. Until the initial swelling and redness have resolved, do not expose the treated area to intense heat or extreme cold. Can Dermal Fillers be Removed or Dissolved? Yes, all hyaluronic acid based products (Juvederm, Restylane, and Voluma) can be broken down in days using a special enzyme called Hyaluronidase. Therefore, the results are reversible. However, hyalronic-acid based dermal fillers also dissolve naturally with time. Note: Radiesse is not made of Hyaluronic acid and cannot be dissolved or broken down with the Hyaluronidase enzyme. Disclaimer: As always, this information is provided to you for educational and/or informational purposes only, and should not be construed as an endorsement of any particular product, treatment, or procedure. This information is not a substitute for medical advice, diagnoses, or treatment by a doctor or other qualified health care professional. For medical concerns, including decisions about any procedure or treatment, users should always consult our doctor or other qualified health care professional. Please visit our Terms of Service to view our full disclaimers.